Ideally situated in a modern purpose-built block, this fantastic two bedroom ground floor flat boasts an expansive reception room, lovely patio and is ideally situated for the amenities of both Isleworth and Hounslow. Golden Court is a wonderful over 60's development which boasts a wonderful communal garden and sitting area. 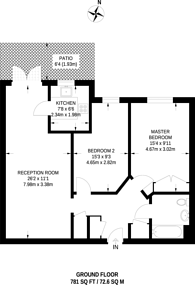 Whilst also being within easy reach of both Isleworth and Hounslow for a variety of amenities and transport links. I often walk my dog in this park. It's a lovely green space in the summer and there's a children's play area too. London's oldest micro-brewery. There is a bar that is very popular with the Rugby crowd and they also do tours.